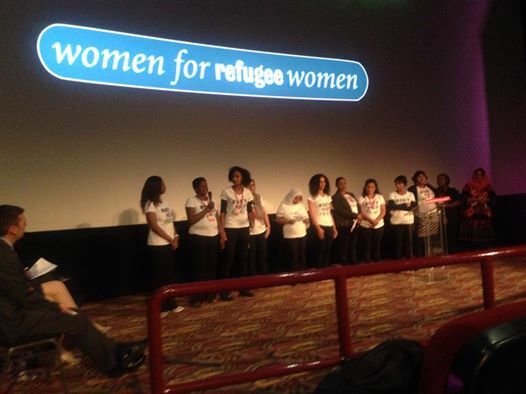 Ghadah al-Nasseri, co-chair of the London Refugee Women’s Forum, writes for us about the Forum’s performance at the Labour Party conference. Sunday 21 September was a day full of hopes and melodies. I woke up with a mission to achieve and a message to deliver. I packed my bag and joined the London Refugee Women’s Forum and Women Asylum Seekers Together London members to go to Manchester. We were off to perform our ‘Set Her Free’ poem at an event organised by Movement for Change at the Labour Party Conference fringe in support of our campaign to end the detention of women seeking asylum. I had been waiting for this day to come after weeks of writing our life story poems together and hours of rehearsing. The past few weeks were a remarkable experience for me working with the Forum and WAST women preparing for the performance day. Throughout the rehearsals, I was touched and moved by the courage of these women to tell their stories, and it empowered me to do the same and share mine as well. We started our bus journey singing Ethiopian traditional songs. The journey to Manchester took many hours, but we were excitedly waiting for the moment to tell our stories and perform on the stage. As soon as we arrived at the conference, we were asked to go to the stage to start our performance. It was a very tense moment as we didn’t have time to do the last rehearsal and sound check. We held hands and went on the stage together believing in and encouraging each other. We broke the silence of the room by performing our poems and telling our stories. It was such a great moment. “I remember feeling scared and uncertain, Detention is like walls closing in, Detention is prison without time limit, detention is prison without sentence, detention is you are guilty without crime,” we said, and the audience heard us. After that, we stood there on the stage all together chanting in one voice: “Set Her Free; Set Us Free”. It was a very powerful and unforgettable moment, full of pride and courage. We received very warm and appreciative applause from the audience. At that moment, we looked at each other and felt proud of our achievement. We realised that we have powerful voices to speak out to tell our stories and make change happen. When we finished the performance and went down from the stage, we hugged each other with tears in our eyes of happiness and success. We did it and we told the world about our memories of hopes, tears, pain, asylum and detention. We did it and we asked the world to listen to us and Set Us Free. Sunday is a day to be remembered. We spoke out on behalf of the voiceless women in detention and we asked for their rights to be given. We will continue to speak out as one voice to end the injustices. We will never be silent again. Let our voices be heard. This entry was posted on 02/10/2014 at 5:35 PM and is filed under Uncategorized. You can subscribe via RSS 2.0 feed to this post's comments. You can comment below, or link to this permanent URL from your own site.